Many residents and businesses are now utilizing surveillance cameras and these cameras may capture persons and events without the owner’s knowledge and this captured information may help the police department solve crimes and help keep the Town safe. By registering your camera system with the Clarkstown Police Department, officers and detectives will be able to identify what cameras may have captured criminal activity. The program is voluntary and you would only be contacted by the Clarkstown Police Department if there is an incident within the vicinity of your camera system and officers or detectives may request to view the footage in order to assist in the investigation. 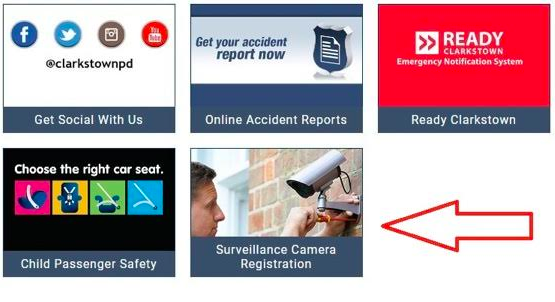 This program is not one that has remote access to your cameras. Attached is a snapshot of the CPD website page. Just click on the video camera picture and fill out the form.